Instagram is a popular online photo and video sharing application that helps users to take photos or videos and share them online instantly. Instagram application is acquired by Facebook and it is available for Andorid and iOS devices. Recently Facebook has introduced the video sharing feature in Instagram that allows you to capture and share videos up to 15 seconds like as Twitter’s Vine application. Do you want to embed or insert your Instagram videos on your blog or website? Here is a simple tool available online to add Instagram videos and the tool is originally developed by the popular blogger Amit Agarwal from Labnol. Now the bloggers or webmasters can add Instagram videos on their site easily. How to Add Instagram Videos on your Site? 1. Go to Embed Instagram online tool. 2. 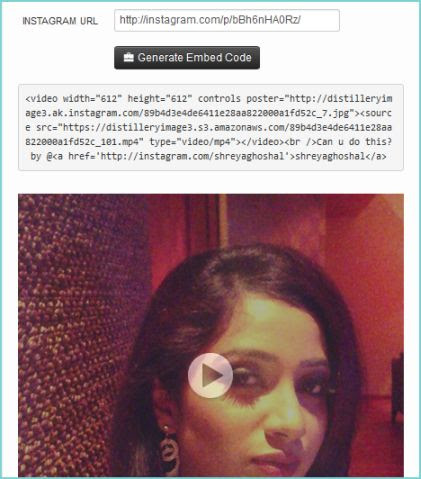 Give your URL of the Instagram video that you want to embed. 4. Then copy the code shown on the page and paste wherever you want. If you want to use Instagram videos on blogger posts, you have to paste the code by clicking "HTML” section of the post editor. That’s all.